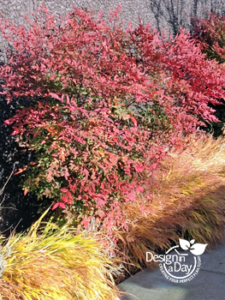 I promised I would follow up from my last blog about Nandina domestica – Heavenly Bamboo and how seriously low maintenance they are. 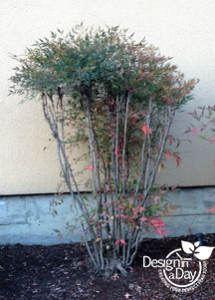 I’ll give you my easy pruning trick for Nandina and you’ll be all set to use this shrub, a low maintenance year round beauty, in your Portland landscape. 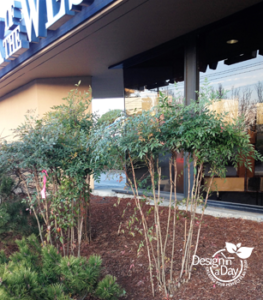 What’s the problem with shearing Nandina? If it’s so easy to prune why do we see so many sad looking Nandina out there? People try to prune them like a boxwood hedge. 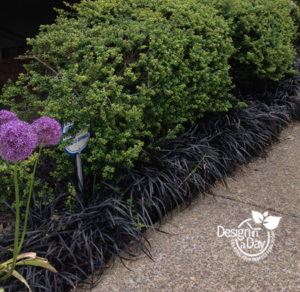 Boxwoods have a typical shrubs’ woody structure and little tiny leaves. They can be sheared and look pretty good. Nandina are a multiple cane plant with a compound leaf composed of many oval shaped leaves. The best way to ruin their appearance is to shear them into little round balls or squares. 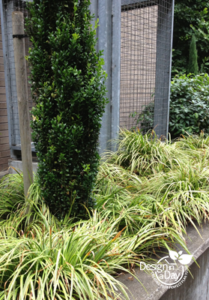 These photos illustrate embarrassing ugly examples of Nandina out there in commercial and residential landscapes. These sad plants at my local bank have not been pruned at all. If yours look this bad, hold off on tossing them. We could correct these ugly leggy Nandinas’ appearance in one year by applying the pruning technique I have illustrated here. 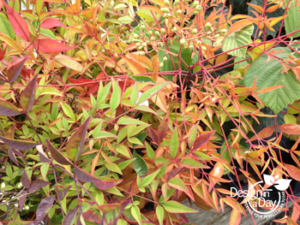 These Nandina domestica ‘Gulfstream’ could look amazing with regular irrigation and pruning once every year or two. My drawing “Fix Leggy Nandina” illustrates restoring a Nandina that has developed leggy bare canes (or stems if you like). 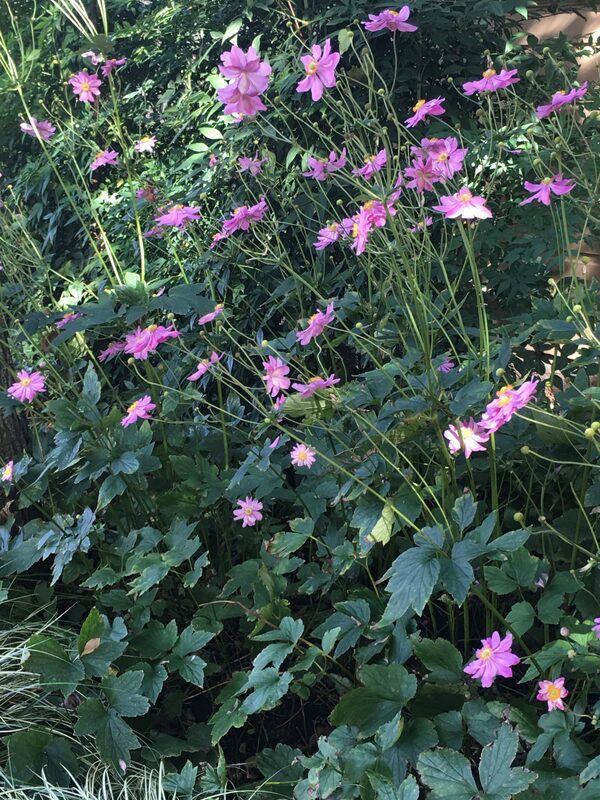 It has no foliage at the base of the plant. The simplest pruning technique is to cut 1/3rd of the canes to the ground and call it done. This technique will get you a much better plant once the new canes sprout. I control the height by selecting the tallest canes to remove. You can take your easy pruning a step farther and select another 1/3rd of the canes and cut them at different heights. 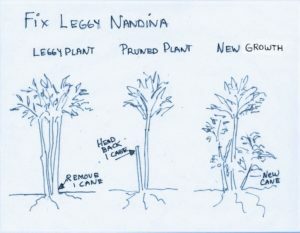 If you only have 3 canes to work with it would look like my “Fix Leggy Nandinas” illustration and in one year it would have a new cane with leaves on it sprouting from the ground and the stem you cut back would have new stem and leaves above where you made the cut. 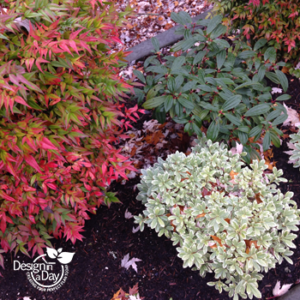 You can prune nandina any time of year here in the Pacific Northwest. I like to remove canes to use for holiday table decoration in the winter but only from a robust plant with lots of canes. I prefer to do restorative pruning (such as in my illustration “Fix Leggy Nandina”) as early as March or as late as May. The technique is mostly the same, but dwarf varieties like ‘Firepower’ need almost no pruning to contain height and if they get enough sun, they rarely get leggy. The plant can get too wide so I like to thin a few canes out at the bottom (or up to 1/3rd of my canes) every year to keep the plant from ever getting too wide. 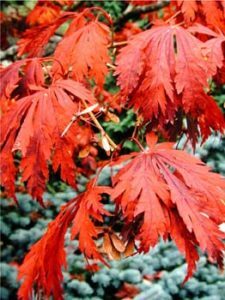 This allows the little plant to continue serving as a colorful year round foundation plant for the long term in your landscape. Here is a good video to illustrate pruning the dwarf varieties. 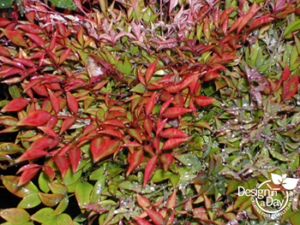 Read my previous blog about Nandina “Colorful Four Season Plant”. 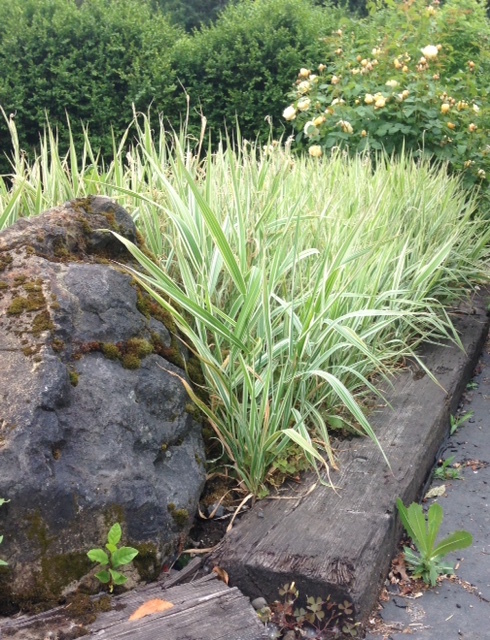 As a Portland landscape designer I enjoy helping clients who want modern landscape design plants. 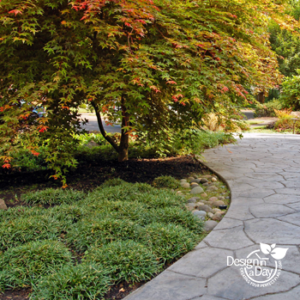 While well crafted hardscape is the key element to a successful modern style landscape, plant selection and how they are used is critical. Here are a few things I keep in mind. 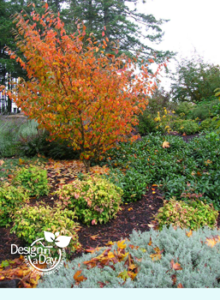 Balanced plant repetition, contrasting textures and overall shapes of plants, full season interest plantings, and low maintenance plants. Keep in mind that the typical plants for modern style are not great for wildlife because they lack diversity. My designs consider the clients many unique interests. 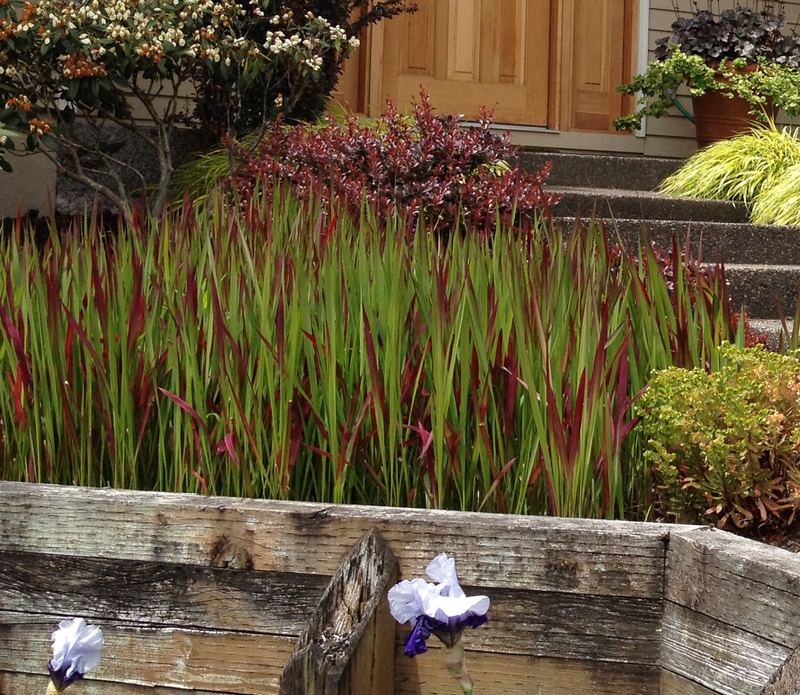 A modern style design can have wildlife friendly plants included. 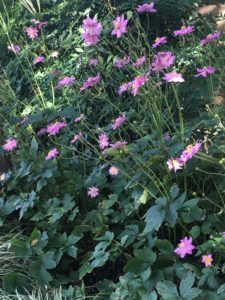 Here are 10 plants that work well for modern landscape design and are fairly easy to find. 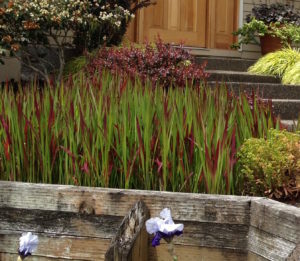 If you are looking to update your design for a modern landscape, contact Carol and start your perfect outdoor space.